Aliko Dangote, Africaâ€™s richest man, according to Forbes Magazine 2019 ranking, is working assiduously to take Nigeria to the next level with the injection of $11billion (about N4.0 trillion) into the recuperating economy. The investment, which has been described as a â€˜transformational project for Nigeriaâ€™, according to the Governor of the Central Bank of Nigeria (CBN), Godwin Emefiele, will go a very long way in achieving the economic diversification plan of the biggest economy in Africa. â€œThis is certainly a transformational project for Nigeria. And it totally keys into the objectives of President Muhammadu Buhari that focus on how we need to conserve foreign exchange, diversify the economy,â€ a visibly elated Emefiele announced during a recent facility tour of the project site situated at the Lagos Free Zone in Ibeju Lekki. Emefiele hinted that a major gain the nation will experience when the projects fully come into fruition by first quarter in 2020 would be to save the economy foreign exchange on importation of petroleum products that accounts for at least one- third of forex spent by the CBN on importation of goods. â€œTo put it in a proper perspective, by the time you dimension the size of the forex we use in importing petroleum products into the country today, it is at least one third of the forex that the CBN spends to import items into Nigeria today,â€ he said. 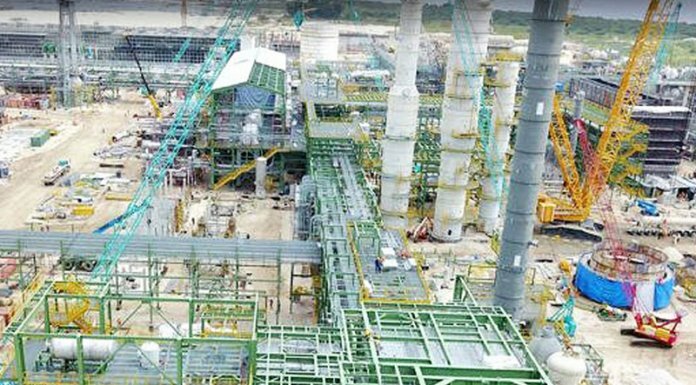 The fertiliser section of the multi-billion dollar project is fully completed as at January 19, 2019 and would be expected to be commissioned for operation sometime between April and May in 2019 while the 650,000 barrels per day capacity refinery is expected to come alive in first quarter of 2020. While the CBN said it will become more aggressive in increasing the list of forex restricted items from 42 at the moment to about 50 as a means to further save forex, Emefiele is confident that by the Dangote projects kick- off, close to about 55 to 60 per cent of what government spends in funding its foreign exchange operations would have been saved. â€œIâ€™m truly looking forward that I would be alive by the time all these come into fruition. We need to really thank the president of Dangote Industries, Alhaji Aliko Dangote, GCON, for this gigantic project. Iâ€™m sure that if he knew the scope of the project that he was going into at the time he conceived of it, with the kind of stress that he goes through today, trying to actualize this project, maybe he would not have started it. But l want to thank him and congratulate him for persevering this stress,â€ he added. The $11 billion project is being funded not only by Nigerian banks, but also by foreign banks as well as equity funding from Dangote Industries Limited (DIL). Dangote, president of DIL, hinted that 60 per cent equity funding is involved in the project, while debt accounts for 40 per cent. A combination of local and foreign banks provides the loan. The CBN is however not left out as it has so far injected N125billion (about $348million) into the actualisation of the project. Though Emefiele described the contribution of the CBN as a drop in the ocean, Dangote said it was a morale booster for the group and a show of commitment by the CBN to grow the economy. Speaking about how much job the project will generate for Nigerians after they come alive, Emefiele said: â€œIf you consider today that we import petroleum products, If you consider today that until just last month, we were importing fertiliser, if you consider today that we import polypropylene products and now we are saying that we will begin to produce them in Nigeria. First, we will save forex; secondly, it will certainly create jobs. These are not jobs from the companies that are producing these products, but be virtue of the fact that you now have people coming here to buy those items, they in turn will also create jobs. There are so many sub-companies that will come to live by coming to do business here. By the time this project comes on live you can imagine the industries that will open around this vicinity. Conservatively, besides the direct jobs from Dangote, millions of indirect jobs will be created around this project. The multiplier effect will be huge and that is what Nigeria needsâ€. But speaking in specific terms, Dangote revealed that about 26,000 workers are currently engaged in the complex and added that that figure will increase to almost 80,000 by the time the projects come alive.